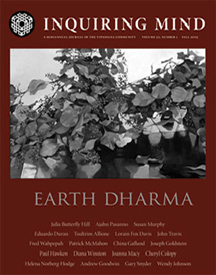 This issue draws inspiration from the Earth-based teachings within Buddhism and spiritual traditions such as those of the Native Americans, and looks at the impact our global economy has upon other societies and other species. Cover art: Stephanie Peek, Reflections I, 24″ x 36″, 2005. Oil on panel. How does meditation practice affect our relationship to the Earth—to its waters and atmosphere and creatures of all species? Read our editors’ thoughts and intentions. Ajahn Pasanno ordained trees in Thailand as a way of saving them, and Julia Butterfly Hill climbed into one grand old redwood in order to save it, creating news that inspired millions. Inquiring Mind editors Dennis Crean, Barbara Gates and Wes Nisker brought the two of them together for a conversation about trees, activism and love. What can we learn from Earth-based spiritual traditions such as those of the Native Americans? We present three Native American teachers—Eduardo Duran, Lorain Fox Davis and Fred Wahpepah—and three Buddhists who lead retreats with indigenous teachers—Susan Murphy, Tsultrim Allione and John Travis. Zen student and mountain walker Patrick McMahon interweaves the path of a Mountains and Rivers Retreat with the story of the Buddha. China Galland inspires us with stories and practices of the Goddess, in particular Green Tara. Diana Winston, Paul Hawken and Joseph Goldstien discuss the intersection of dharma, ecology, sustainability and the future of our planet. Eco-philosopher Joanna Macy encourages us to engage wholeheartedly with the challenges that climate change presents. Tibetan scriptures prophesy the melting of the glaciers on the passes between Nepal and Tibet—and it’s happening now. Environmental reporter Cheryl Colopy describes the impact of climate change on this rugged, thin-aired landscape and its Sherpa villages. Helena Norberg-Hodge argues that global industrialization leads to disconnection, psychological deprivation and environmental breakdown. But Buddhism’s philosophical foundation and emphasis on compassion put engaged Buddhists in a unique position to lead the way out. Walking at the Albany Bulb, a former garbage dump reclaimed by nature and art, Barbara Gates muses on love, loss and mischievous perseverance. A reflective essay by professor of media studies Andrew Goodwin on time, modernity and dharma. Gary Snyder reveals the inspiration and context behind his “Smokey the Bear Sutra,” a timeless and timely classic in Buddhist environmentalism. Inquiring Mind book review editor Ronna Kabatzick talks with Gil Fronsdal about his new translation of the Dhammapada. At Green Gulch Farm Zen Center, Wendy Johnson shows how the Four Noble Truths relate to gardening and meditation. Wes Nisker thinks we humans had better wake up and smell the CO2. The wolf is now at the door, stopping by on its way to extinction.